Baking season is upon us, and I’m ready!! I’m armed with plenty of butter, the freezer is stocked with puff pastry, my vanilla supply is in full force, I’ve stocked my sugar jar and I can’t be stopped! First up this year is this Vanilla Apple Tart. 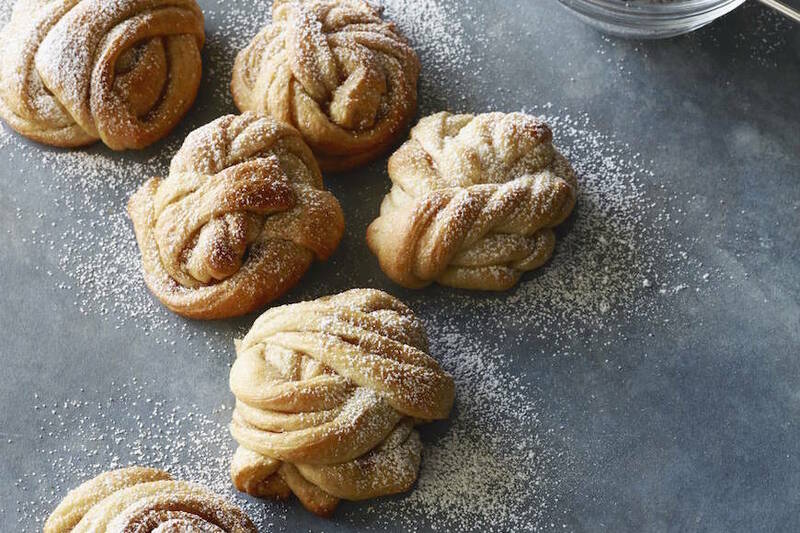 It’s one of those perfect desserts that you can use any time this fall, especially since the ingredients are almost always stocked in the kitchen. Even better, the crust is just a sheet of pre-made puff pastry (that you can find right in the frozen food section), because have you ever tried to make homemade puff pastry!? No one has time for such things! This tart could make an appearance at a dinner party, Thanksgiving, Christmas or New Year’s Eve… basically any occasion that calls for a super epic dessert, this is your ticket! And the best part, there is no sharing involved because everyone gets their own! Jackpot. I’ll be serving it up at our first big dinner party of the season in a few weeks to kick-off Halloween! All of my friends will be there, costumes in tow, and besides our costumes, this dessert will be the highlight of the meal!! And, I’m making a promise to myself right now to keep all dinner parties this season simple. That means making a few really superb dishes and letting them shine. No need to make a billion things – it’s quality over quantity guys!!! 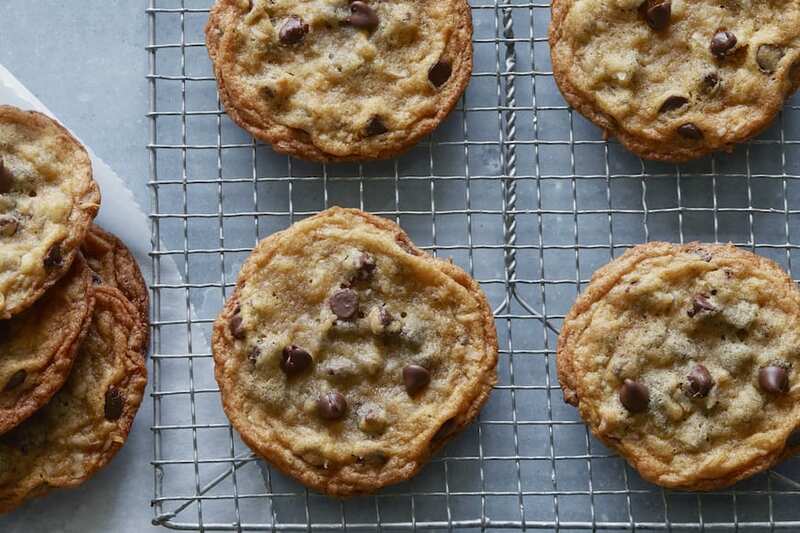 AND – to get you guys ready for the fall baking season, I’ve got a $100 VISA gift card to give away so you can stock up on all of your baking necessities (or, your fridge with your favorite wine). Whatever you do with it, enjoy!! To enter, just leave a comment below telling me your favorite way to spend quality time with friends this fall. Dinner parties? Dinner out on the town? Weekend getaways? SPILL IT! 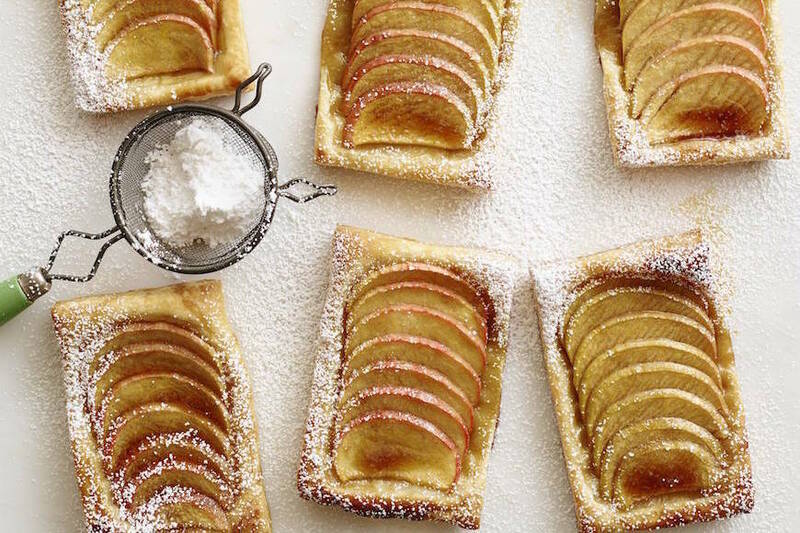 And then make these Vanilla Apple Tarts! 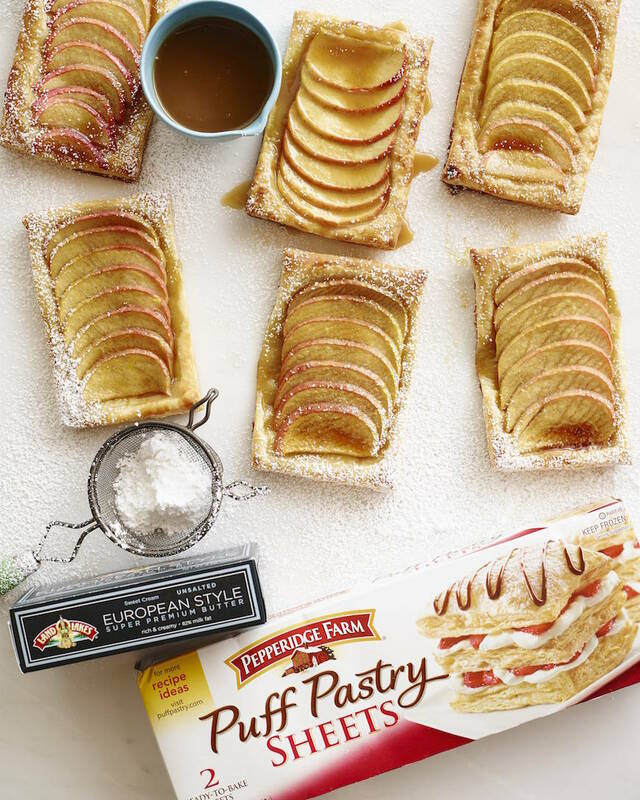 Place the puff pastry rectangles onto a silpat lined baking sheet. Add the sugar, salt, lemon juice and vanilla bean seeds to the apples. Stir to combine. Allow to sit for a few minutes. 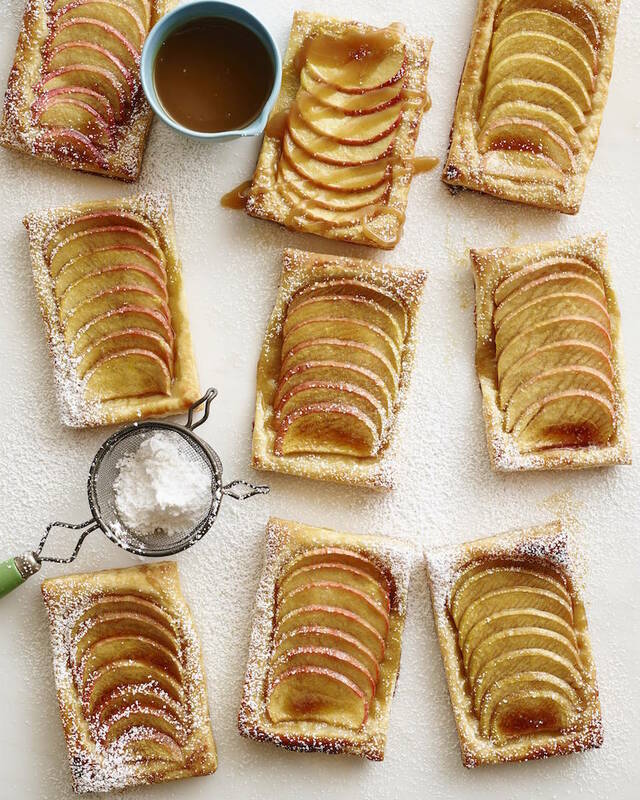 Arrange the apple slices on the pastry rectangles in a straight line, overlapping as you go. Dot the top with little bits of the butter. Bake until the pastry is puffed and golden brown, about 20 minutes. Remove from the pan immediately and place on a serving platter. Serve with caramel sauce on the side. This post is brought to you in collaboration with the National Frozen and Refrigerated Foods Association and EasyHomeMeals.com. All content, ideas, and words are my own. Thanks for supporting the sponsors that allow me to create new and special content like this for What’s Gaby Cooking. Oktoberfests are my favorite fall activity! This is my first one living in CA-much different than Chicago. 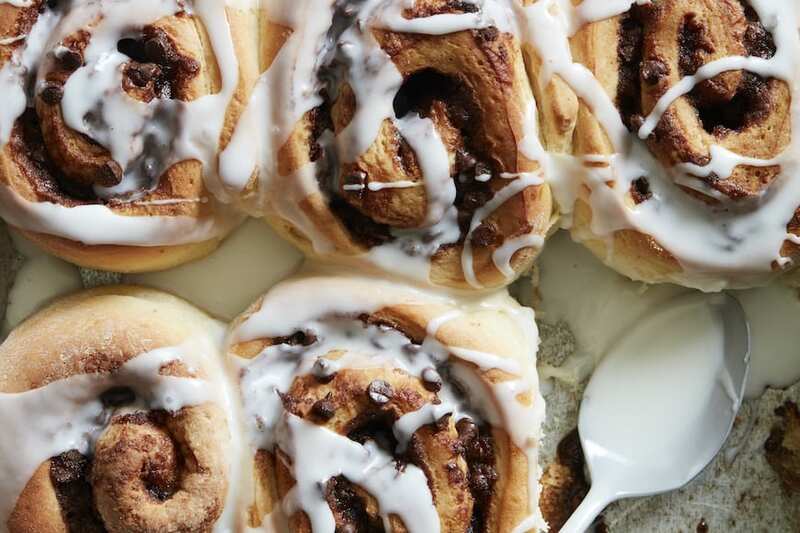 Can you substitute the vanilla bean with vanilla extract instead? 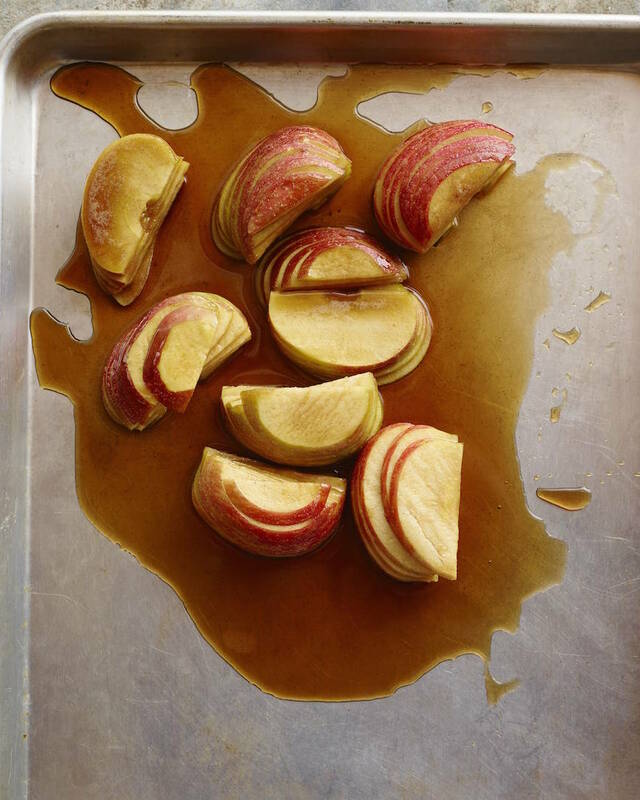 And can you bake the apples using parchment paper and a baking sheet?